A screen shot of the new PET/CT scanner at Windsor Regional Hospital, February 12 2019, courtesy of Windsor Regional Hospital. Some 600 local cancer patients every year are referred to London and further beyond for a PET/CT scan, but soon they will not have to travel any further than Windsor Regional Hospital’s Met Campus. The hospital announced Tuesday morning it would begin construction soon at the Cancer Care Centre on a unit to house the new diagnostic suite. The scanner will arrive April 15, and it could start scanning patients by late April or early May. Windsor Regional Hospital has a scanner but needs a new one. Up until now, CEO David Musyj said it was up to the hospital to fund capital costs like PET/CT scanners. However, changes at the provincial level mean that cost will be picked up by the Ministry of Health and Cancer Care Ontario. “We were lucky enough, as a region, to need a new replacement of a PET/CT and the Government of Ontario came forward, and Cancer Care Ontario said ‘you’re going to be the first’,” said Musyj. 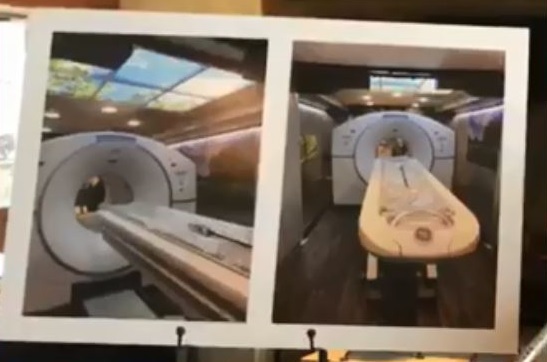 Initially, the plan was to open the PET/CT suite by the end of last year, but the hospital had to reassess its options when construction estimates for the suite housing the unit came back higher than anticipated. It had hoped to put the unit near its MRI unit. He also said the suite would be specially decorated. “We’re going to make it look as outdoorsy-look as possible, so they’re not looking at four bland walls to make our patients as comfortable as they can be,” explained Musyj. A PET or positronic emission tomography scan creates 3D images showing how cells work in the body. A CT or computed tomography scan uses special X-ray equipment to produce pictures of the inside of the body. Both are standard for helping diagnose cancers. Once the new acute care hospital is built, the scanner will be transferred to the new site.